This challenge features calming colors to inspire you — Biscotti, Coral Crush, Blu Raspberry, and Factory Green. The palette for Color Challenge 56 is perfect for desert designs. 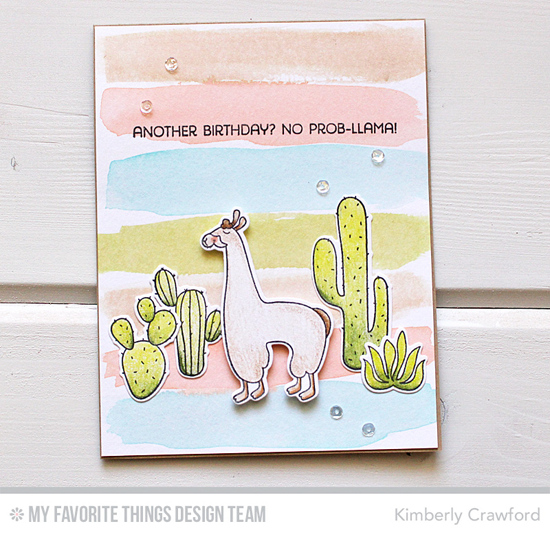 Kimberly created this cute and trendy southwestern card with the Llama Love stamp set and Die-namics. Barbara pulled together this layered and textured design incorporating patterned papers from three different paper packs that fit our color scheme to a T. The pretty technique she used with our Moroccan Lattice stencil makes for even more delicious touchability. Vika's design featuring the Beast Friends stamp set and Die-namics is sweet as can be with its cute little yeti sharing holiday cheer. Blu Raspberry makes an awesome sky color, and I love his Coral Crush scarf! Congratulations, Sandi Pressley! You are the randomly selected winner of the MFT Color Challenge. You can view all the entries from the last challenge HERE. You have until Wednesday, November 9th, at noon EST to add your link and be eligible for the prize of up to $20 in MFT Cash. Winners are chosen at random, so everyone has a chance! The prize is a $15 Gift Voucher to My Favorite Things, but if you use MFT stamps and/or dies in your project, you’ll receive an extra $5. Oh my gosh! I am so excited to have won! My wish list is sooo long....now to decide what to get.